Tá clár nualach ceardlanna á reáchtáil ag ImaginationGYM® i rith Seachtain na Gaeilge 2017. Tá an cheardlann bunaithe ar chláir fuaime agus gníomhaíochtaí atá sé bunaithe, a dearadh go speisialta, chun an tsamhlaíocht, foghlaim inchinne agus iléirim páistí 5 bliana agus os a chionn a fhorbairt. Is slí spraíúil agus idirghníomhach é ceardlann ImaginationGYM® chun cabhrú le páistí teacht ar a gcuid cruthaitheacht nádúrtha agus bua ealaíne. Is ar an gcéad chlár fuaime sa tsraith, dar teideal An Choill Draíochta,atá an téama bunaithe. Spreagann an clár fuaime le páistí a gcuid scéalta féin a chumadh trí iad a mhealladh chuig domhan na samhlaíochta, a bhfuil an béaloideas, an dúlra, ainmhithe, ceol, brionglóidí agus mianta mar chuid de. Foghlaimeoidh na páistí faoin tslí ar féidir leo cur lena gcuid samhlaíochta, agus faoin tslí ar féidir leo spraoi dearfach a bheith acu go cruthaitheach trí leathanaigh ghníomhaíochta bunaithe ar an ealaín. Is do ghrúpa páistí, idir 7 agus 12 bhliain d’aois, a dearadh an cheardlann seo, a mhaireann uair a chloig amháin. Is ann do dhá fhormáid ceardlainne (ceann amháin do ghrúpa ina bhfuil suas le 15 pháiste agus ceann eile do ghrúpaí níos mó, ina bhfuil suas le 30 páiste). Is féidir formáid na ceardlainne a chur in eagar do pháistí amháin nó do pháistí atá i dteannta a gcuid tuismitheoirí/caomhnóirí. Is féidir le ceardlanna a athrú de réir riachtanais na bpáistí o thaobh teanga.Is féidir ceardlanna a reáchtáil i leabharlanna, i scoileanna, in ionaid ealaine nó in aon ionad eile. ImaginationGYM® are available to run workshops for children during Seachtain na Gaeilge 2017. The workshop is based around specially designed audio programs and activities which develop imagination, whole brain learning and multiple intelligences in children and adults. The ImaginationGYM® workshop is a fun and interactive way to help children access their natural creativity, and artistic talent. 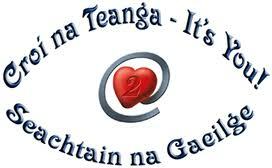 It is themed around the first audio program in the series titled An Choill Draíochta (The Enchanted Forest). This audio program encourages children to create their own stories by bringing them on a journey into an imaginative world of folklore, nature, animals, music, dreams and wishes. Children will learn to stretch their imagination muscles and have fun taking positive action on creativity with art activity sheets. The one-hour workshop is designed for groups of children aged 7-12 years with two workshop formats (one up to 15 children in a group and larger groups of up to 30 children). The workshop format can be arranged for children only or for children with their parents/ guardians. Workshops can be run in libraries, in a school environment, arts centres or other venues.